Did you hear the story of the Johnstone twins? Set in 1960’s Liverpool, the story surrounds the ever growing Johnstone family. Blood Brothers is a heart-warming story of twin brothers Mickey (Sean Jones), and Edward (Mark Hutchinson) separated at birth. Soon they are brought together again by friendship, but their mothers, alongside social divisions, strive to keep them apart. The narrative is echoed distinctly through dark rhymes and moving musical numbers, which bring plenty of laughs (and tears!). Lyn Paul instantly steals each scene as single mother, Mrs Johnstone. Vocally strong, her voice fills the room, and it is guaranteed that goosebumps will be setting up camp on your arm in seconds. Sean Jones as Mickey and Mark Hutchinson as Eddie are both fantastic, excelling both the roles of cheeky young boys and grown-up men. Mickey’s childish, foul-mouthed antics, contrasted with Eddie’s ‘posh boy’ persona makes for quite a few giggles. While the two of them are so different, they connect on such an extortionate level and exude a unique chemistry. Though out of the two, Jones’ giddy imaginary horse-riding antics certainly stole the show. Danielle Corlass proved herself to be incomparable for the role of Linda. Her transition from the playful seven year old to the flirtatious fourteen year old, and then to the worried young wife was excellently portrayed. Dean Chisnall foreshadows an unsettling sense of dread as the narrator; he lingers throughout the entire performance serving as a haunting reminder of the twins’ fate. The musical numbers were wonderful too – ‘Marilyn Monroe’ particularly stood out and the closing number ‘Tell Me It’s Not True’ was a poignant end to the production. The rest of the tunes sadly don’t ring to the ears quite like the others, and are merely forgettable. The packed crowd rose to their feet in a standing ovation, as the cast took four encores. 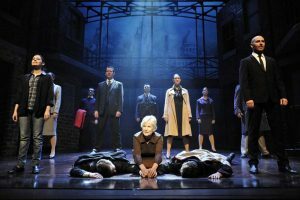 Decades later, Blood Brothers continues to be a timeless tale, successfully captivating an audience. Blood Brothers is at the New Theatre until Saturday 30th September and tickets can be booked here.